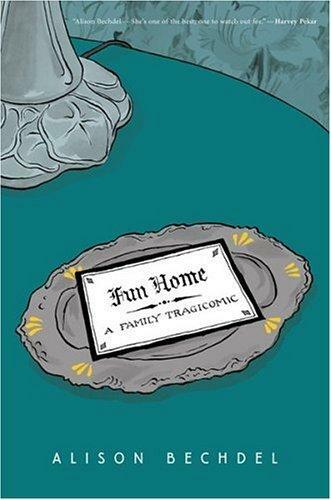 I have recently been trying to get back into reading graphic novels and comic books and I would say that Fun Home, by Alison Bechdel, is probably the best bridge between books and graphic novels you will find. It has everything you would want from a graphic novel, it’s short and sweet, features a loveable art style and the font is clear and easy to read, which is a godsend to anyone who like me, struggles with reading some fonts. It also however has the depth and writing style you would desire from any autobiography. In Fun Home, Alison, author of the well known comic strip Dykes To Watch Out For, tells the story of her not so fun childhood in Pennsylvania, how she discovered her sexuality and her relationship with her closeted father. The title Fun Home refers to the name her family came up for the funeral parlour her father worked in, where they often helped out and her father developed a rather relaxed attitude towards death. Her father’s attitude toward death is discussed a lot throughout this book as she considers the circumstances of his death, which she suspects was suicide. Bruce, her father, is described as a complex and rather troubled man who struggles with his homosexuality and seems unable to truly connect with his family apart from on a few brief occasions. There are huge amounts of conflict between Alison and her father through her childhood, most of which surrounds the touchy subjects of her father’s obsession with creating their home into an extravagant Victorian style mansion and his more feminine attributes, which he clearly tries to pass onto his daughter. Gender roles come up a lot in this book as Alison contrasts her father’s femininity with her interest in men’s clothing and her desire to have a purely functional home when she grows up. It seems they are at odds with each other for a good portion of the book however as she gets older and her father realises he could actually talk to her on an intellectual level they grow closer. The point in which they are closest was shortly before his death when they go to the movies and he opens up to her slightly about his own sexuality. This conversation clearly meant a lot to them as it is a key part of the climax of this book. I loved this as I think it clearly portrays how most people discovering their sexuality feel. In Fun Home, Bechdel talks about her “research” into her own sexuality, which she carries out at college via masturbation, reading books on homosexuality and visiting her college’s gay union. 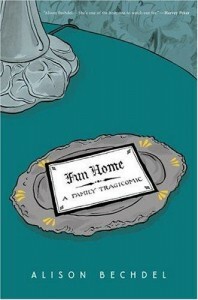 I rather enjoyed reading Fun Home and it has inspired me to read some more graphic novels. The next one on my reading list is, the sequel of Fun Home, Are You My Mother, in which Bechdel talks about her relationship or rather lack of relationship with her mother. We are grateful to the Glasgow Women’s library for this review.